Blog Quick Quotes: Mixing it Up with Marcia! Mixing it Up with Marcia! With October creeping up on us, I thought I would share a Halloween layout. Quick Quotes has many collections that go so well with each other that I challenged myself to use some of my scraps. The background paper is part of the wedding collection, Simple Elegance. I am also using some Dreamscape, Tin Type, and of course the fun Halloween collection. 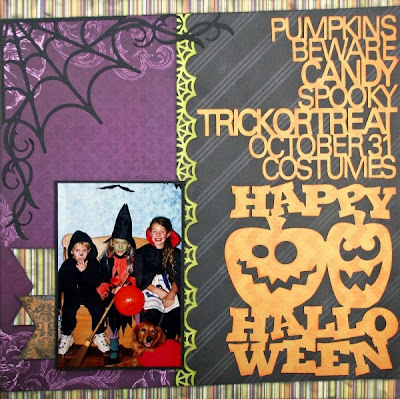 This is a pretty simple layout with lots of fun Silhouette die cuts. The photo is an older picture of my kids. I so wish Minnesota was warmer for Halloween. Winter coats need to be worn most years. Our Spooks here are a bat, a witch, and a vampire. This is a great layout Marcia!! I LOVE the words down the side... very cool! Love, love love the words down the side, fun layout!